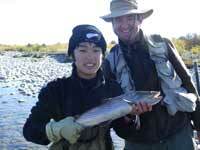 My last clients for the 10/11 season were from Japan. With the closure only a day or 2 away it was also the last chance I would have of going for a flick myself. I'm not a guide who has to get out fishing as soon as I get some time off. I'm just as happy to be out there with my clients as I consider guided fishing a team effort so whether I am actually holding the fly rod or not doesn't matter! I get a big kick out of seeing my "guys" connect with a trout so don't need to "do the business" myself. 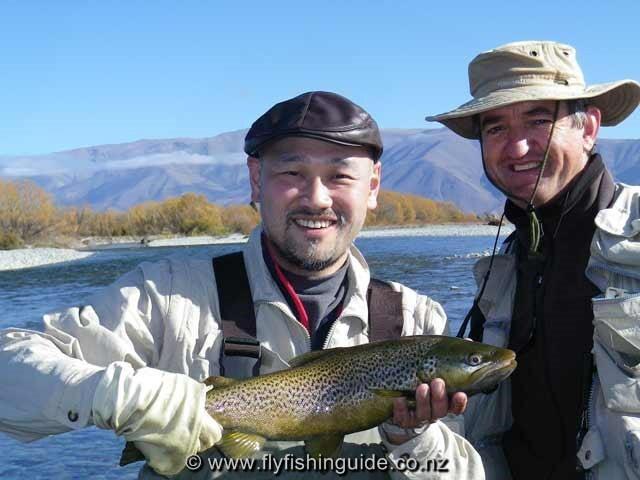 Yasu and his son are very keen anglers but typical of the pace of modern life don't get much of an opportunity to get out on the water. As luck would have it, the fish were feeding so in spite of the lack of practice we were soon into our first brownie of the day. 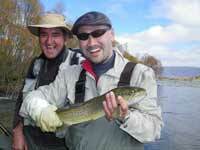 Over the next few hours several other trout, both brown and rainbows, ended up in the net. I don't think I have ever seen such broad grins!!! Eventually the hatch started to wane - cue for us to head on home! It's not impossible to catch a fish or two after a hatch has ended but after intense activity it is all a bit of an anti-climax!!! In any case we left the river on a high with my friends vowing to return. Fingers crossed that didymo doesn't come back too quickly and that the Tekapo gets a reprieve at least for the start of the 2011/2012 season which is the first Saturday in November. Happy times late in the season for Yasu. Yasu junior on the Tekapo.